Chances are, if you ask me about a foundation- I’ve tried it! I’ve dealt with acne off and on since I was a teenager so I’m always looking for the perfect foundation with full coverage along with one which doesn’t irritate my skin. Currently, my “go-to’s” include Make-up Forever Ultra HD foundation and Maybelline Fit Me foundation (I’ve actually been mixing those two to get the perfect shade as I’m in between right now). 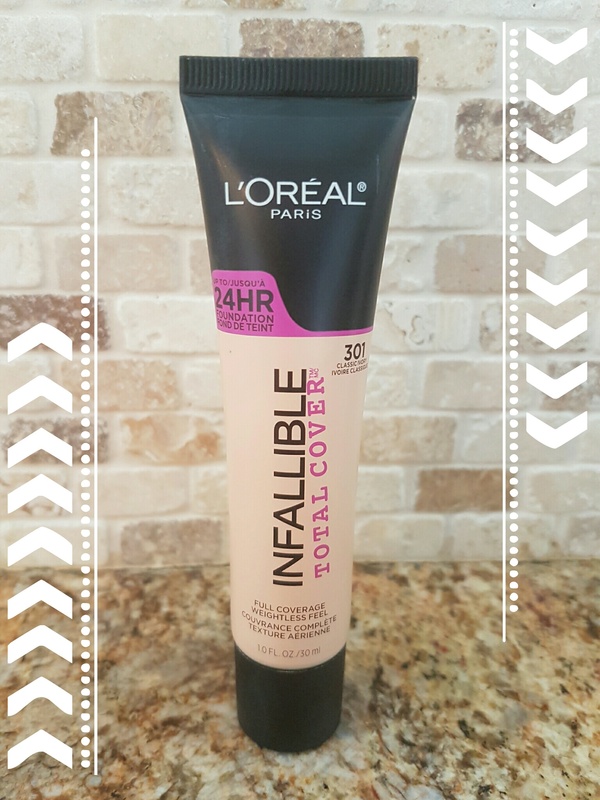 I do love those foundations and I’ll do a review on them at a later time as today is about L’OREAL Infallible Total Coverage foundation. I bought this foundation in a spur of the moment Walmart visit! The full coverage caught my eye so I purchased the shade classic ivory and decided to give it a try! The result: full coverage! I was pleasantly surprised that this foundation actually provides full build able coverage. It comes in a squeeze tube and appears fairly thick (compared to thinner, water based foundations) but for me this meant less foundation used as I didn’t have to layer as much! The foundation lasted all day and didn’t wear down over the course of my day. After using products for a few days if they’re going to irritate my skin, it happens then. I’ve been using this foundation for a week now and no break outs or irritants! I would definitely purchase this foundation again (maybe in a darker shade), but if you’re looking for full coverage at an affordable price – give this a try and let me know what you think! ← New Year, New Product…. If you don’t mind me asking, what skin type are you? I’ve been using this foundation and it makes all of the oils on my face sit on top of the foundation and look really disgusting after a few hours, and i wouldn’t even say I’m that oily. It never breaks the foundation but it just looks awful haha. I love it for photos and filming though! Hey! No problem at all – thats interesting considering youre not usually oily! – my skin is very dry and dehydrated. Do you use a primer at all? With this foundation I’ve been using Maybelline blur and illuminate (just started it) normally I use smash box or cover fx primer – not sure if that may help! Or a setting Spray? Might help make a difference if you wanted to try!